According to “ESPNU SEC Correspondent Bama Online/Rivals Host Crimson White Senior Sports Reporter Uwire.com/Palestra.net Sports Reporter” Britton Lynn, this sign “popped up on the quad today” at the University of Alabama. These have actually been on the quad all semester. I’m not sure what the motivation was for them, but it wasn’t the recent developments. That’s been the policy for a while. I’ve got a friend that goes to school there and he was irked when he couldn’t put up his ENO hammock – even though he had the “tree hugger” straps that ensure no harm to the trees. 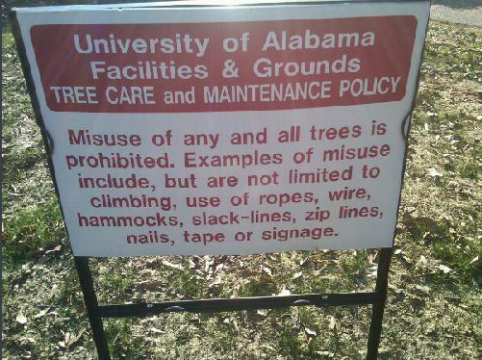 I was going to say that as far as I know there arent any “special” trees at Alabama. After reading previous posts it looks like somebody trying to add garbage to an already bad scene. Actually I attend UA and these signs have been up since I have been attending UA which was this fall. This is just trying to make Bama look even worse for something one person did. You might want to get the information right next time. ROLL TIDE.